What Are the Types of Thermoplastics and Their Uses? Thermoplastics are used in a wide variety of industries for all types of different products; but what are the different types of thermoplastics and their uses? Thermoplastics are highly versatile materials which are made from polymers. A polymer is constructed of monomers, or tiny molecules which are electrically joined. When a thermoplastic is formed, it is a resin which is heated; as it cools, it becomes flat after rolling or takes the shape of a mold. Because they can be easily melted down into liquid form and restructured, thermoplastics are recyclable and environmentally responsible. They are available both in everyday consumer products as well as highly technical industrial applications, from construction to medicine to space exploration. There are several different types of thermoplastics. The word “nylon” tends to bring to mind applications for women’s clothing, from stockings to sportswear. But nylon has far more uses, and is in a myriad of places and uses. Nylon, designed in the late 1930’s as a cheap and easy-to-dye alternative to silk, is a thermoplastic composed mostly of distilled petroleum. Nylon melts nicely for restructuring, but it is also more flammable than other fabrics and does not hold up well under UV rays. 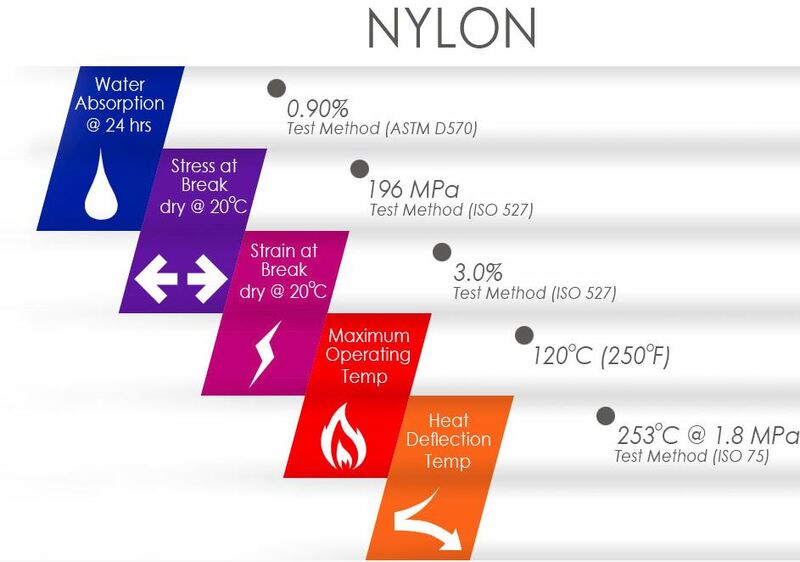 Adding flame retardants and UV stabilizers can usually help strengthen nylon products. Nylon is strong, relatively cheap, usually doesn’t shrink much, and incredibly light. It also repels water quite easily when used as a fabric. However, its resistance to regular wear might come at a cost to the planet: Nylon decays slowly, so it is a less environmentally friendly form than other thermoplastics. However, new techniques allow nylon to be produced from biomass materials, which means that it will decay more quickly than forms of nylon which are completely synthetic. It sounds like a toddler’s game, but PEEK is a grown-up industrial giant when it comes to types of thermoplastics. PEEK stands for PolyEtherEtherKetone, and is common in high-temperature manufacturing applications. Although a synthetic material, PEEK is also usually strengthened with composites of glass and carbon to make for a stable and strong material. 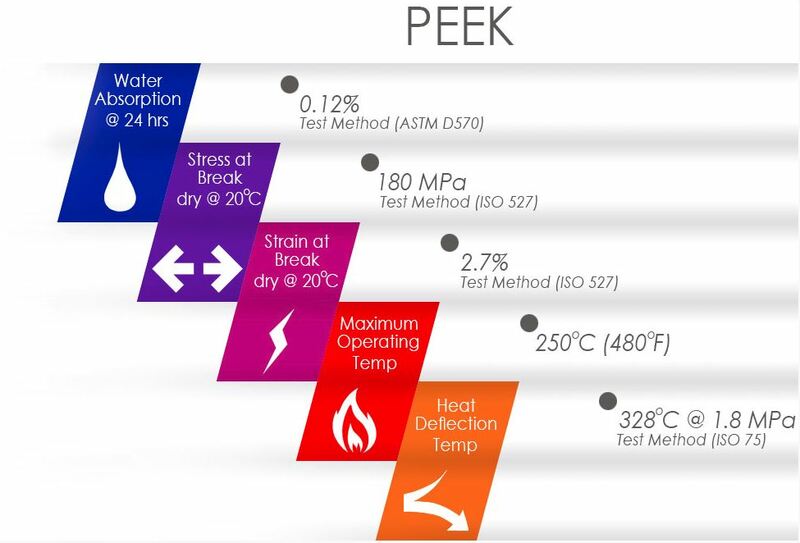 Its usual melting point is 350 degrees C.
PEEK is a relative newcomer to the thermoplastics family. It became available from the FDA in the late 1990’s and stands up well to harsh environments. It does not catch fire nearly as quickly as nylon and can even withstand certain amounts of radiation, which makes it highly useful in the field of medical equipment. Although it can work with organic acids (such as citric acid) to a certain extent, PEEK cannot withstand high amounts of sulfuric acid or hydrochloric acids. PEEK can also be used in the production of electrical connectors. In addition to manufacturing, PEEK is common in the aerospace industry, and, because it does not absorb water, in marine and oil extraction environments. Carbon-PEEK is a form of PEEK which is reinforced with carbon fiber. This addition makes it much stronger and offers more consumer applications than PEEK alone. Mechanical engineers are especial fans of carbon-PEEK. When combined with carbon, PEEK is stiffer and has a vastly increased load capacity. It also has a higher compressive strength, which means that it can increased pressure without fracturing. 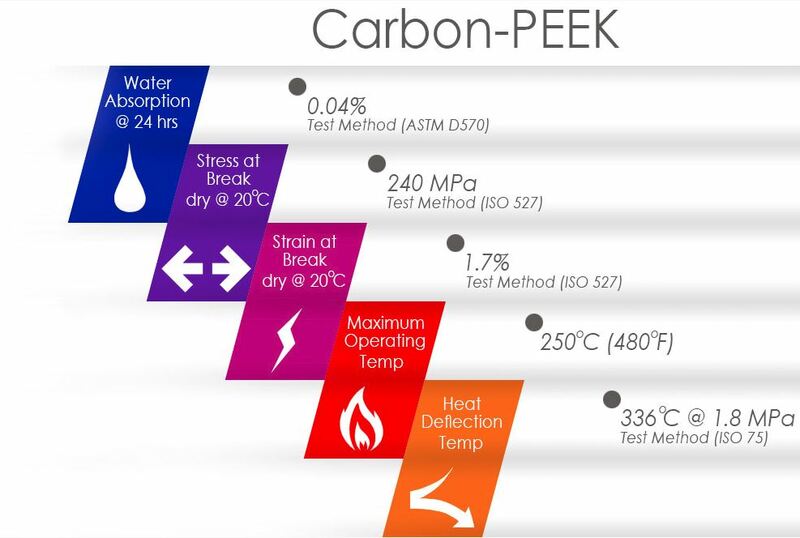 With more thermal conductivity, Carbon-PEEK does not expand as much as other thermoplastics might, and since it is a semi-crystalline polymer, it can stand in for most metals for without risk of corrosion. Because it’s tough as well as light, many prosthesis or orthopedic implants use at least some PEEK. Like original PEEK, it does not burn easily, and when it does, it does not emit worrying amounts of smoke or toxic gases. Carbon-PEEK, however, is more expensive than in its original form. It typically uses carbon fibers as 30 percent of its composition, which means can be almost as lightweight as nylon. Carbon-PEEK makes an appearance in the automotive, aeronautical, and aerospace industries due to its resistance to heat and low weight ratio. Unlike nylon, because of its relatively high carbon content, carbon-PEEK exits manufacturing a dark black color. Where would home decorators be without acrylic? You probably know this clear, strong material by its usual trade names of Lucite and Plexiglass. Artists and contractors are familiar with acrylic paint, which is available in an incredible range of colors, ages well, and dries quickly. Acrylic reached the market in the early 30’s and is widely available commercially. Extruded acrylic begins manufacturing as a liquid plastic, then is available commercially in sheets. While this kind of acrylic is cheaper than other forms (sometimes it even cracks during the manufacturing process), it is softer and scratches more easily. Cell cast acrylic begins in a mold and is far more expensive, however it is much stronger and more durable. Half as light as glass and clear from the greenish tint of thick glass, cast acrylic is popular in skylights, airplane windows, and bulletproof materials. You can buff scratches away, unlike glass, and although some cheap forms of plastic cannot withstand UV rays, proper cast acrylic can. Acrylic, however, melts and burns fairly easily and at lower temperatures than PEEK and carbon-PEEK. It can also crack under heavy loads or repeated use. When it burns, acrylic is liable to liquify quickly while releasing toxic fumes. Nevertheless, acrylic is typically in yarns, furniture, and LCD screens. There are many types of thermoplastics that are available to use. Depending on your industry, your manufacturing process, and your products, you will want to choose between these types of thermoplastics. Nylon: popular for industrial injection molding and 3D printing technology due to its strong, cheap, and light-weight qualities. However, it is not environmentally friendly. PEEK: popular for aerospace or medical equipment, or in conditions of high heat, chemicals, water or steam since it does not catch fire easily and can withstand radiation. However it cannot withstand acid. Carbon-PEEK: popular for automotive, aeronautical, and aerospace industries prosthesis or orthopedic implants due to its inability to burn, resistance to heat, and it’s lightweight material. However it is much more expensive. Acrylic: popular for plexiglass, furniture, and windows as it is lightweight and strong. However, there are two types to choose from, and it melts and burns much more easily and can crack under use.